The route of our Hunter Pace today, right on the outskirts of Walden Pond. Today Freedom and I participated in a Hunter Pace. For the uninitiated, a Hunter Pace is a timed ride where you try to come the closest to an “optimum” pace that is set either by a specific team or by averaging the scores of different riders. There are different ways to calculate the optimum time and all of them have their benefits and limitations. Today, we were the “rabbits” and set the optimum time for the Fences Division. We were, however, a bit too fast. It didn’t feel that fast. In fact, we mostly trotted. And since my friend Carol was able to keep up on her non-hunting fox trotter, I thought we were in good shape. But we did get round the course in less time than I’d anticipated. Probably it was because we didn’t stop except for the check. Yesterday, Freedom was jumping out of his skin and I worried that he wouldn’t be that much fun to ride — jigging, bouncing and jumping up into the air gets old after awhile. But boy, was I wrong. Today he was all business. He deigned to walk down a couple of rocky hills, but the rest of the time he asked (quite politely) to move out and was happy to go on a loose rein. 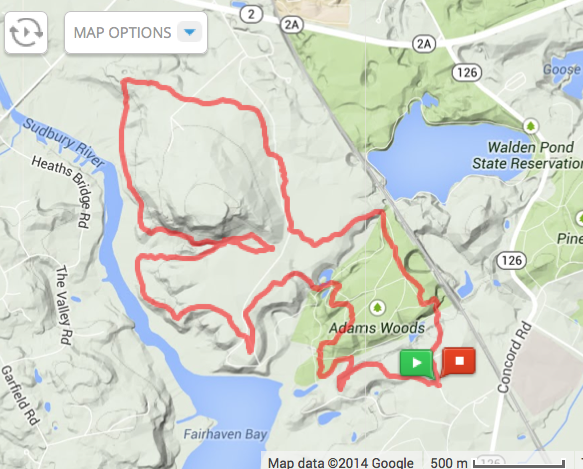 The venue for the pace event was an area next to Walden Pond called Adams Woods. It’s full of very nice bridle paths and has the added benefit of lots (24) of cross country jumps — they range in size from about 18″ to 3’3″ and they are mostly very inviting solid fences that horses jump well. I’ve had some “issues” jumping Freedom in the hunt field so far this fall as the nature of galloping up to fences as part of the field is difficult for him. I think it’s sensory overload: he gets so caught up in keeping up that he forgets to look at the fence. Now me? I like the horse to pay attention. Today was a perfect schooling opportunity and we took full advantage of it. He was focused, he didn’t rush and he jumped like he was on springs. Before we went out I reminded myself that it would be highly inconvenient if I were to fall off today — for one thing, I needed to set the pace, and for another, I had to drive my daughter to a regatta as soon as I got home and I didn’t fancy doing that with a lot of bruises. Luckily, he was so honest and forward to the fences that I stopped worrying and just let myself enjoy it. There’s very little better than jumping cross country on a horse that is so obviously having fun. We did lose a shoe in the last part of the pace. We’ve had rain all week and Freedom has been standing in mud. It didn’t slow him down much; I didn’t even notice it at first. Thankfully the footing was soft enough that he didn’t tear his foot up at all. Someone turned in a shoe at the end of the day and I’m hoping it’s Freedom’s. It would be so much easier for my farrier to just tack the shoe back on rather than make another one.